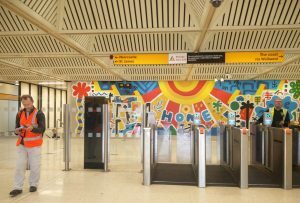 Our day-long adventure on the Newcastle-Upon-Tyne Metro saw me taking on the persona of Patricia, a 67-year old lady who was a new arrival to the city. Patricia and I have that in common – I’d just moved to the city less than two months previously, and so when I read my persona card for Patricia, her jaunts to the museum, shopping and coffee in the centre of town, it rang pretty true for me. Coupled with my background of working with older people, I felt right at home, though I also made sure to speak to people I met along the way. I worked with Simon Bowen, whose persona that day was of a dad with young kids, and we boarded at Monument to begin our journey east towards the sea, where I lived and where Simon was visiting with his kids. We got off at Byker to have a poke around the station. As Simon imagined the dangers the outside roads posed for his imaginary kids, I engaged the two attendants at the ticket gates. I asked them about their experience with older people throughout the Metro stations. They reported the escalators as dangerous for some older people, who may often be commuting alone to carry out their shopping and for whom the combination of steep, moving steps and heavy bags poses a challenge. The gates themselves, they explained, could be difficult as well – for some older people, the ticketing system was confusing, and barring that, the gates themselves were problematic. Sometimes they just didn’t work, they said, and demonstrated by passing a staff card multiple times over a nearby sensor to no response from the system. This seemed to be a bone of contention, as were the ‘jumpers’ who would vault themselves over the gates, often in full view of attendants. “It’s like Cheltenham around here,” said one of the attendants. I’d seen this happen a few times and it can contribute to a slight sense of danger in the stations, which are often dark and unmanned at night-time. Beyond this, the existence of petty, low-level incidents like this can have a serious impact on the experience of older people around the Metro system. At North Shields, I spoke to a lady whose experience travelling home on the Metro one night was marred by abuse from a group of young boys. She scolded them, and they turned on her, shouting abuse and threats. She thought the other passengers would stand up for her, but they weren’t interested. Once she reached her home station, she disembarked only for the boys to follow her, shouting, all the way to her house. She must have been very frightened, and indeed she said she modified her journey after this so that she would not have to take the Metro at night. A pity, as one of the reasons she had moved to the house she lived in now was because of its proximity to the Metro. From the perspective of people with dementia and their carers – my particular research area – the scarcity of toilets and the lack of clarity surrounding where they actually might be was a problem. Beyond this, although staff at the barriers were kind, funny and helpful, I was unsure as to how they would react to a person with dementia who couldn’t operate the gate, or a carer who needed help finding a way down to the platform. Of course, there were upsides to the experiences of older people on the Metro as well. As we travelled back to Monument, I sat down with a group of three sisters, all retired, who spoke about using the Metro to explore areas around the city where they have rarely visited. All three spoke about how the Metro allowed them to explore and make the most out of days together, even if it just meant getting a coffee in a nice café in Sunderland, or going for a walk along the beachfront at Tynemouth. It’s easy to consider the negatives of the Metro system, especially from the perspective of older people – the dangers, the confusion, problems with accessibility – and indeed these gaps are where we should start our work to ensure the Metro is safe and open to all. However, what I also encountered on my day on the Metro was a sense of ownership and civic pride in the system – it broadened horizons, connected families, and was an opportunity to sit down, read a book and have a coffee on the way out to the seaside or in to the shops. The people I spoke to felt like they travelled on “our” Metro – of course, it is theirs, which is why it’s imperative to engage diverse citizens like this before important design decisions are made.